The probability of selling to an existing customer is 60-70% versus the probability of selling to a new one at 5-20%. The basic lesson from this is that the ROI with selling to your existing base is much higher than selling to prospects. That doesn’t suggest that you abandon new customers, just that you need to be aware of the revenue possibilities with your current customers. How you develop loyalty and capitalize on it requires a bit more study. In today’s fast-paced digital cornucopia where sales can be acquired literally with no human contact, you have to be careful to design your programs in a way that requires and takes advantage of contact. Making connections can happen all along the buyer’s journey, both during and after the sale. Use every touch point to better know your customer and understand their needs. Despite the idea that your products might sell themselves, passive marketing really won’t help you boost those cross-sell or upsell opportunities. Once you’ve done the work to make connections, apply direct marketing practices that create targeted messages for your customers. Chances are you’ve implemented systems and tools designed to acquire new customers. Those same tools, or similar ones, can also work to cross-sell to those bank customers already on board. Your database information should grow after you make that first sale to ensure you can continue to benefit from it. Implement retention processes and systems to make sure you’re putting just as much effort into impressing your loyal customers as you are your prospects. Cross-selling or up-selling to existing customers is much different than selling to prospects. By developing and ensuring the quality of the customer relationship, you establish your reputation and the reputation of your products. 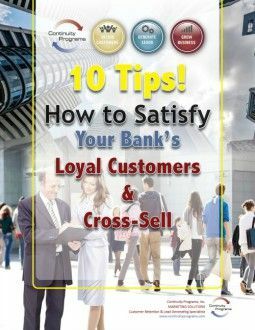 Check out this 3-page PDF, “10 Tips: How to Satisfy your Bank’s Loyal Customers and Cross-Sell” and decide which tips you can put into place right now.